This is a large annual show of paintings, indoor 3D sculptures and a fantastic array of outdoor sculptures, all displayed in a beautiful garden surrounding the elegant Arts and Crafts Building Prior's Field. Well worth a visit. I also have sculptural work and tableware permanently displayed at the Art Shed at The Medicine Garden in Cobham, open every day from 10am-5pm (4pm on Sundays). The Gallery is a cooperative of 15 members displaying art and craft work in a range of materials. Again a delight to visit. My simple rustic Dorking Country Tableware is available at No5 Interiors at 5, West Street, Dorking. This is a wonderful cornucopia of authentic vintage furniture and unique pieces with a unique atmosphere and some very special pieces of furniture and quirky 'objets d'art'! 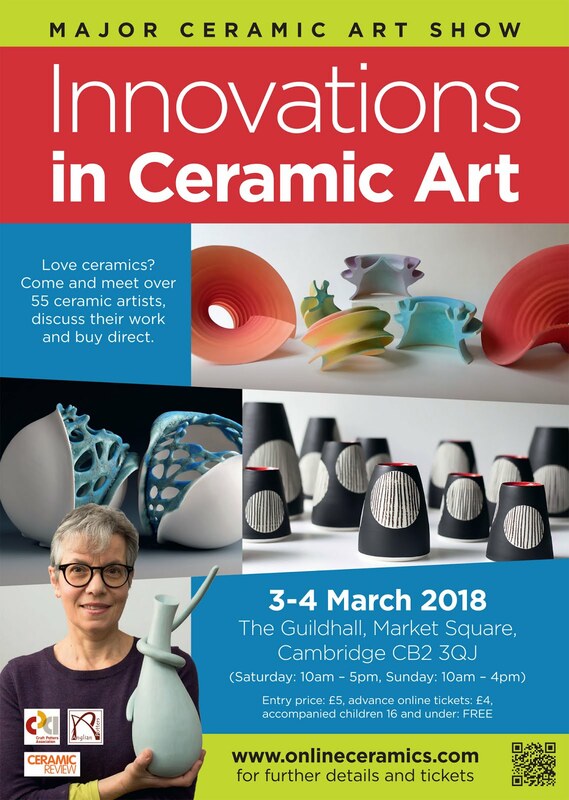 Plans for 2018 included showing at Innovations in Ceramics, a major Ceramics Show held in Cambridge on Saturday 3 - Sunday 4 March. The two-day ceramics fair has recently been specifically devised to gather together the very finest of current new ideas in clay in Britain. Unfortunately I had to back out due to ill health, but I am hoping to return to the show in 2019.